Since 2002 our little observatory is mainly dedicated to NEO follow-up work, chasing and confirming newly discovered minor planets crossing the earth' orbit. After years and nearly 2000 positions measured we finally made our first discoveries in 2008. Compared to the long lists of other amateurs our 4 MBA's (main belt asteroids) up to this date are nearly nothing. But the first two discoveries of 2008QX19 and 2008RZ77 came within a week and we were happy. But both objects faded away beyond the range of our telescope. In December 2009 they "brighten" to magnitude 20.2 and 20.9 and hopefully we'll be able to recover both of them. If you are an astrometrist and and looking for targets please see our follow-up page. Besides this exciting work we still find time to make some pretty pictures of the other inhabitants of the universe. Our efforts and hopefully also our progress can be followed in the gallery. Enjoy! During our recent vacation at our favorite location in southern France, a new combination of equipment was used. 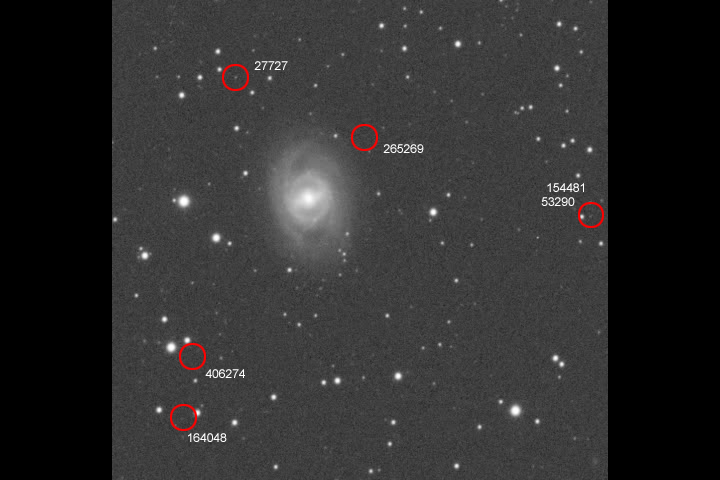 One of our targets with a LZOS Apo 123/738 was the galaxy group of M95 and M96. 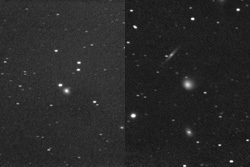 Together with an SBIG ST8300 CCD-Camera, we exposed 20 unfiltered images of 600 seconds each on March 13, 2018 from 20:29 UT to 23:43 UT. The entire two-week stay was characterized by extremely bad seeing and repeatedly interrupted by many clouds. The galaxy is located in the constellation Leo and very close to the ecliptic. Therefore, it turned out that a lot of minor planets were to be expected on the images. The field of view of the entire image is 84x63 arcminutes. Already in the small section around M95 there were 6 minor planets down to a magnitude of 19.9 mag after only 10 minutes exposure time. Here again it shows what a dark sky can do. At home in Germany, we reach this maginutude with the 14-inch mirror after a good 20 minutes. From a small section centered around M95 we made an animation where you can see very well how the main belt asteroids move in the same direction with almost the same speed. You can also see the considerable air turbulence and a drifting focus. The field size of this image detail is approx. 30 x 20 arcmin., North is down and East is to the right. Overall, the image was exposed for 11 hours 20 minutes. A LRGB color image as final result can be found in the gallery here.. Finally on Sunday, June 17, 2012, after a long period of unstable weather, I loaded my target list of minor planet followup observations for an unattended imaging run. The list contained two recently discovered NEOS: 2012 LD1 and 2012 LT7, PHA 2004 CL which was only seen for two nights in that opposition at that time, NEO 2012 BC20 deep in a crowded milkyway starfield, and numbered NEO (317685). The run was supposed to start at 21:30 UT. I was a little ahead of time. Flatfield and bias images ready, initial focus done. At 21:05 UT it was not dark enough for those faint objects. So I decided to take a shot on PHA 2012 LZ1 which was discovered on June 10 and passed the earth on June 14 in 14.5 LD (lunar distances). Only a couple of days after closest encounter this object was fairly bright with a magnitude of 15.0 but still pretty fast with an angular speed of about 30 arcseconds per minute. With an exposure time of 3-5 seconds it sould be possible to make it visible on a single exposure but preventing the object from trailing. The pointing of the telescope was a matter of a minute and a sequence of 80 images was taken from 21:15 - 21:24 UT. First the size of 2012 LZ1 was thought to be around 500 meters according to its brightness and distance. Because of its size and proximity to the earth this object was selected as radar target for the famous Arecibo radio telescope in Puerto Rico and the results where a bit surprising: 2012 LZ1 is almost twice as big. Scientists where able to determine that this space rock was only reflecting 2-4 percent of the sunlight that hit its surface. A surface as dark as coal. This not so little sucker (approx. 400-600 meters) will encounter the earth at a distance of 8.63 LD (lunar distances) on September 29, 18:43 UT. It will be a radar target a Goldstone and Arecibo. Due to its highly eccentric orbit it is possibly an extinct comet belonging to the Jupiter-family. We contributed astrometry on Aug. 23 and Sept. 9 to the MPC (MPEC 2009-R32). 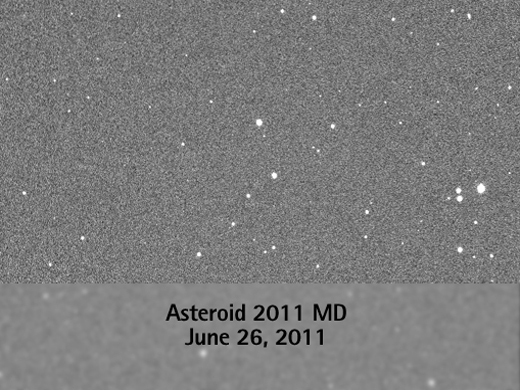 In the 30 minutes exposed image the asteroid shows up as a bright streak. During this time the object was clearly visible on a single 30 second exposure at mag. 17. It will brighten up to magnitude 14 and be an easy target for amateur telescopes. From September 19 - 30 1998FW4 is moving through the constellations Aquarius, Aquila and Ophiuchus accelerating rapidly. After September 30 it will be unobservable. C/2009 R1 McNaught is currently the brightest comet in the summer sky. After a long break due to bad weather we finally managed to catch this object in the morning dawn of June 5 in the low northeastern sky. During this 20 minute exposure the last quarter moon was also already well above the horizon. Currently C/2009 R1 reaches magnitude 6 and is a nice object for binoculars. If predictions are true he could get as bright as magnitude 3-4 but observations with the naked eye will be difficult because of its low altitude. The best observing conditions will arise in the following two weeks till mid June. Mc Naught reaches its closest approach to earth on June 15. After June 22 the moon will again interfere and the angular distance to the sun is further decreasing. The image presents a nice long plasma tail and a shorter dust tail. The plasma tail is in fact much longer. Our 14" with a focal length of 2.100 mm show only a small piece of 25 x 16 arcminutes. After the image we inspected to comet visually through the 14 inch telescope. The tail was not visible but the coma bright, round and approx. 5' in diameter. 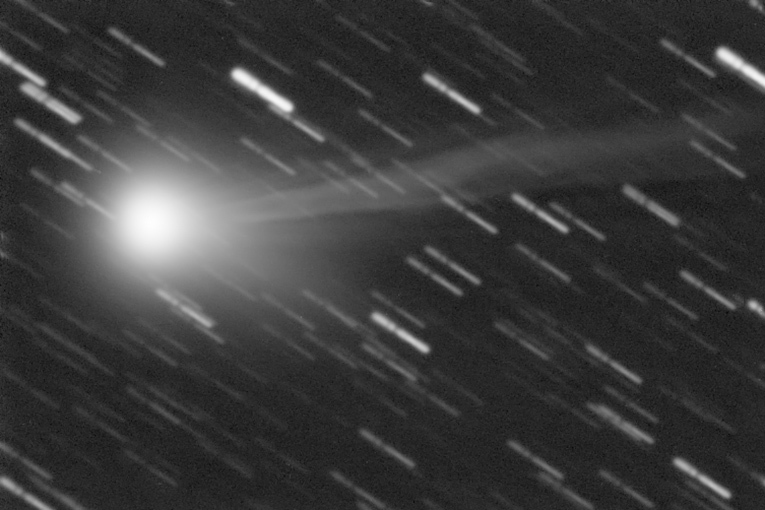 Rob McNaught discovered the comet on September 9 with the 0.5 Uppsala Schmidt Telescope of the Siding Spring Observatory at a magnitude of 18. 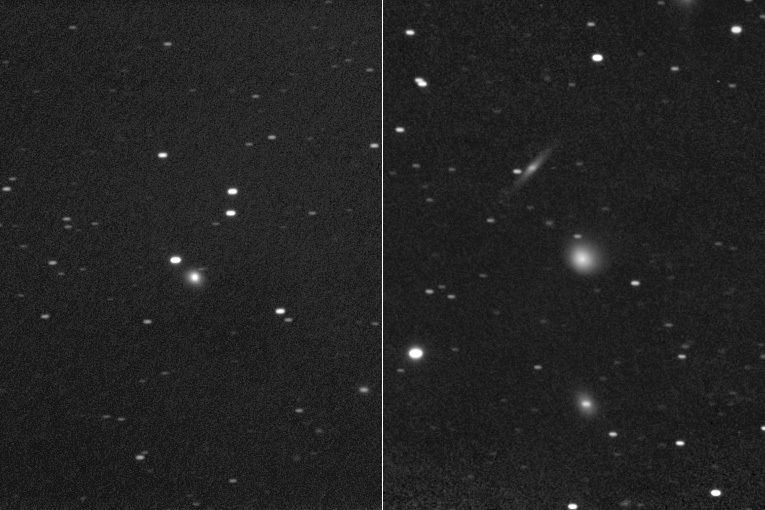 Siding Spring is also involved in continuous asteroid surveys. A few days after its discovery Comet P/2010 H2 (Vales) is further developing its appearance to a "real" comet. The former asteroidal NEOCP object 04F0011 now shows a nice 2' size coma. The left image was taken on April 19 and the right on April 22. 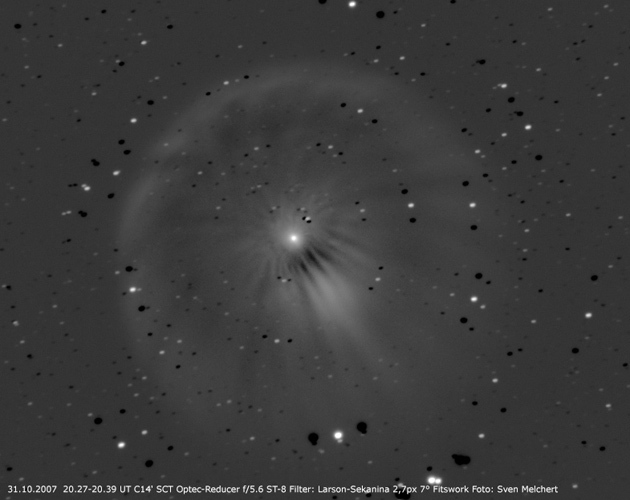 Both shots were made with the 14 inch telescope and the SBIG ST8-XME camera in 2x2 binning mode. Exposure time was 40 x 30 seconds with no filter. Still there is no real tail but the false nucleus is slightly off center and the coma expands more to the northeast. Comet Vales has a Hilda like orbit and circles the sun in a distance of 3.06 AU every 7.5 years. Hilda type asteroids have a stable orbit in a 2:3 resonance to Jupiter, which means that they orbit the sun 3 times for every 2 times that Jupiter does. So they stay away from the giant gas planet avoiding dangerous close approaches. But it is very likely that Comet Vales will be kicked out of orbit by Jupiter someday. ... surprised astronomers around the world with a spectacular eruption. On October 23 it brightend almost a millionfold from mag 17 to mag 2.5 in just a few hours. The above image was taken on October 31 at Guidestar Observatory through the 14 inch telescope. It shows the inner green coma and some dark structures near the nucleus. A Larson-Sekanina filter was applied to the luminance channel to bring out the streamers and subtle jets (click on image to enlarge).